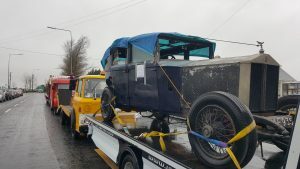 NAF 935 :: Oldest Rolls in Headford ? NAF 935 :: now what ? 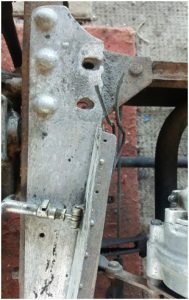 The 1st job was to assess the list of many missing and obviously broken parts to the Rolls and set a rough action plan. I decided to strip the wings, running boards and brackets for shot blasting and etch priming + undercoating, as these were badly needed. 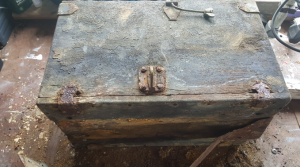 Some of the brackets were rusted away to the point of no use…. 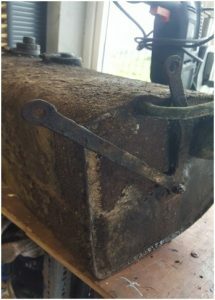 Sadly, after much careful effort, the crow bar, 12” chisel and hammer with help from an angle grinder was the only way to remove the 88 year-old bolts from the chassis. Mr Royce would not have been impressed. 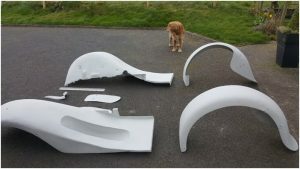 – Aluminium Bonnet, Floor panel, Front and rear Wings to Fergus Naughton Balligar for soda blasting, etch priming and undercoat. 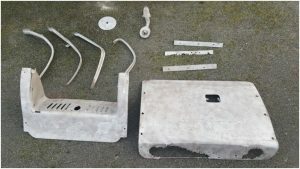 The rotten fuel tank and front bonnet mounts sent to be copied by Patt Rynn Engineering, Galway, along with a huge number of other brackets, clips, shafts, fuel tank cover, starter cover, wheel plates, etc. An endless journey to the docks almost daily. Pat had previously agreed to help on the project, I asked for an apprentice to undertake the work, as the budget was 13k for the complete rebuild, including new paint job, new interior, spares including clock, rear lights, carpeting, replacement roof, wiring, 75% chassis sandblasting etc. Our dog, Finn, inspects the repaired wings after soda blasting and undercoating. You could have a “guess the car” competition. As the car came from the UK, I decided to try and keep it registered there. She started like registered as UW 5505, then was changed to UU 8608 and then, in 14th Oct 1950, changed to NAF 935, with old pics to support this. 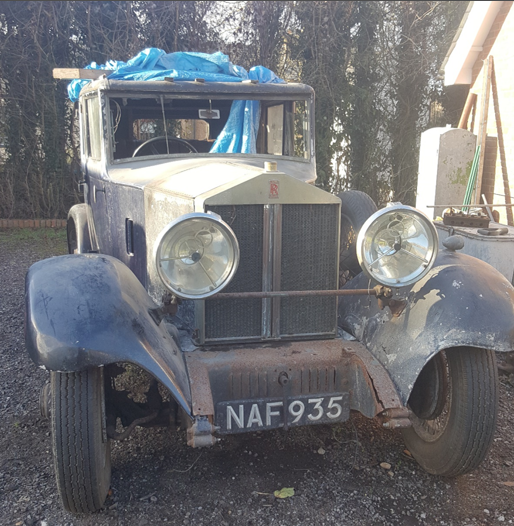 However, she was never formally registered as NAF935 to the UK DVLA, so after attempts of getting proof of registration, I had to settle of using UU 8608, as this was supported by documents from the RR Enthusiasts club.